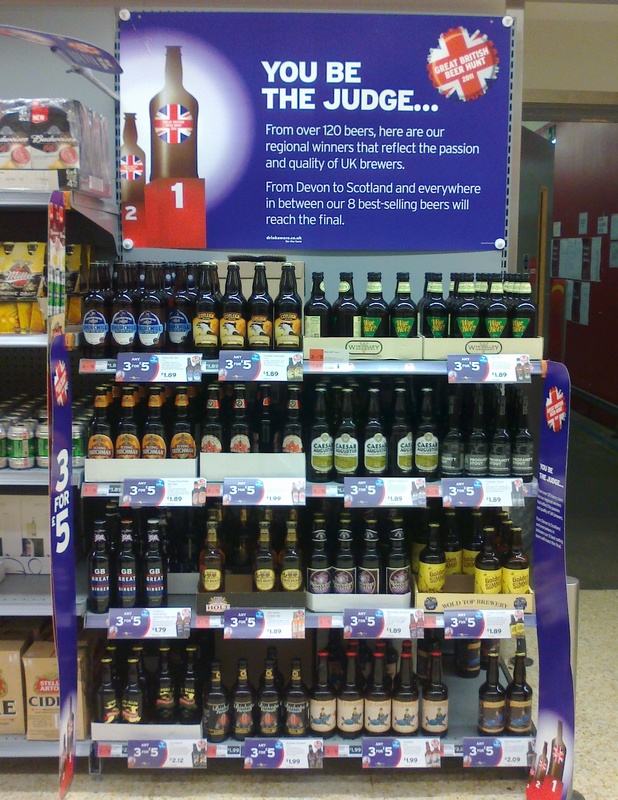 Those of you who don’t shop in Sainsbury’s may not know that the supermarket is midway through a beer promotion/competition pitting beers from around the UK against each other to win a permanent place on the shelves. The Great British Beer Hunt started on 7th September and runs until 27th after which there will be a grand final to decide two winners. Sales of the beers will apparently come into the decision, so it looks worth voting with your feet (and then your mouths) if you’ve got a favourite you want more of – and you’ll be supporting the brewer at the same time. Worcester Sorcerer, Sadler’s Ales, Stourbridge . I’ve tried five of the 16 so far and a pleasing by-product is that it’s helped me begin to conquer my ‘fear’ of dark beers, so much so that they are leading the field in my own personal Great British Beer Hunt. William Bros Profanity Stout (7%) inspired anything but profanity when I tasted it. It turned out to be what I call a ‘dancing beer’ – that is one that makes me dance with glee after just a little sip because it is so delicious. To describe its flavour as sweet doesn’t do it justice but it is a sweet tasting beer with a rich coffee and chocolate aftertaste. If you’re not a big fan of coffee and/or chocolate then you might not love it like I did, but if you are then this gorgeous stout will probably remind you of good quality, high cocoa solids chocolate or of the best chocolate mousse you’ve ever had (in my case made by a now long, lost love and featuring coffee among its ingredients). If you don’t normally drink this kind of beer, try it just to humour me. I wasn’t expecting to be so blown away by it but now I can’t wait to have another bottle. Ridgeway’s Bad King John (6%), described as a ‘black ale’ also had elements of chocolate, but was a much more earthy, warming beer than the Profanity Stout and while I didn’t get much of an aroma when I sniffed the former, there was a distinctly liquorice fragrance emanating from Bad King John. It struck me as a winter cheer beer, one to stock up on to keep the cold away and your spirits up through fast-approaching dark months. And so to the lighter beers. Surprisingly, given that I loved their Profanity Stout and am also a huge fan of their Ceilidh craft lager, I was rather disappointed in William Bros’ Caesar Augustus (4.1%) which is not to say that it is a bad beer, far from it, but the anticipation created by the idea of a lager/IPA hybrid was more exciting than the beer itself. However, it was drinkable and although it wouldn’t be my first choice it is definitely worth a try. One that I wish I hadn’t tried though was the disappointing Worcester Sorcerer (4.3% ). I will confess that there is a chance that I over chilled the bottle and added to the gassiness therein, but when I tasted it I was reminded of all those conversations about women (and men) being put off beer because it makes them bloated. It also seemed to have too much going on flavourwise, as if it couldn’t decide what sort of beer it was. If you decide to try it anyway don’t put it in the fridge for long – that might sort out the gassy problem. Expect a rather sweet beer, with elements of toffee apple (as per the label). Despite the fact that I didn’t like this I must put in a word for Sadler’s excellent labelling which included detailed tasting notes, food matching suggestions and even recipe ideas. I enjoyed Wold Top’s Golden Summer (4.4%) and if you like a golden summer ale you will too. It has a honey sweet (but not cloyingly) flavour with a dry aftertaste. It would be easy – not to mention pleasurable – to put away a few of these. I definiately like the sound of the chocolately beer! I’m interested to hear what you make of the Full Bore as it’s a local Devonshire beer…hopefully, yet another good reason to buy local. Karen, it is the next one on my list! Ha ha! “Dancing beer” is a lovely descriptor. Chilling a beer will actually decrease the gassiness of the beer, as when a water (and therefore beer) gets colder, the solubility of CO2 increases, meaning more gas dissolves into the liquid, leaving less as bubbles (visible carbonation)… Sounds like it was a good thing you chilled the beer in question, or else you might have ended up wearing it instead of sampling it! Keep happy, and you’ll have to return to Brecon at some point to have a look at the new brewery! Great post! I have a Profanity Stout and a Bad King John lined up for tasting in the next week – both from Sainsburys. Your reviews made them sound just how I like ’em!